"I hate to say I'm moving beyond anything because I don't want to denigrate that work or that audience...But most of my stories are going in other directions now. It got to a point where I was starting to repeat myself. How many ways can I shoot a high school hallway? I'm sure there are millions that I haven't thought of yet, but I felt I should get away and explore what's next." It will never cease to amaze me with how much of a road map John Hughes created for me. Beginning with "Sixteen Candles" (1984), my relationship with the work of Writer/Producer/Director John Hughes has served a wide variety of functions. Certainly, with comedy, John Hughes existed as much of an instructor as all of the comedians, performers and writers that I had already adored. Unquestionably, Hughes was a leader with music, as there are so many artists that I never woud have heard of, let alone listened to and embraced if not for him. Undeniably, Hughes was a teacher regarding writing as the existence of this blogsite is as much a testament to him and his massive influence upon my life as much as it is to the medium of film itself. But then, there is something much more ephemeral with the work of John Hughes and how it has affected me throughout my life, especially during my adolescence and my college years as the finest of his work was being first released to the world and I ended up watching and re-watching endlessly. Admittedly, these days, I do not watch Hughes' films very much at all. Not because my love for them has lessened (not in the least) but maybe because I have watched them enough to fill five lifetimes. Perhaps, the distance is a great thing because even as I know the films backwards and forwards, the existing lapse from not having seen them does create for a certain disconnect as well, so when the inevitable reunion occurs, it is like seeing them anew or at least, with fresher eyes. At this time, I turn my attention towards "Planes, Trains and Automobiles," John Hughes' holiday classic now reaching its 30th anniversary! In addition to this milestone, it exists as one of his films that achieved the rare status of becoming a box office and critical hit, an accomplishment that often eluded him, at least from the standpoint of critic approval. And why should it not as the film represented Hughes operating at the very peak of his powers during an enormously fruitful and furiously paced period during which he wrote, produced and directed "Planes Trains and Automobiles," "Ferris Bueller's Day Off" (1986) and the delayed (more on this later) "She's Having A Baby" (1988) back-to-back-to-back, while also miraculously finding time and opportunity writing and producing the Howard Deutch directed "Pretty In Pink" (1986) and "Some Kind Of Wonderful" (1987). I remain flabbergasted to this day that Hughes was able to accomplish this exceedingly prolific feat. 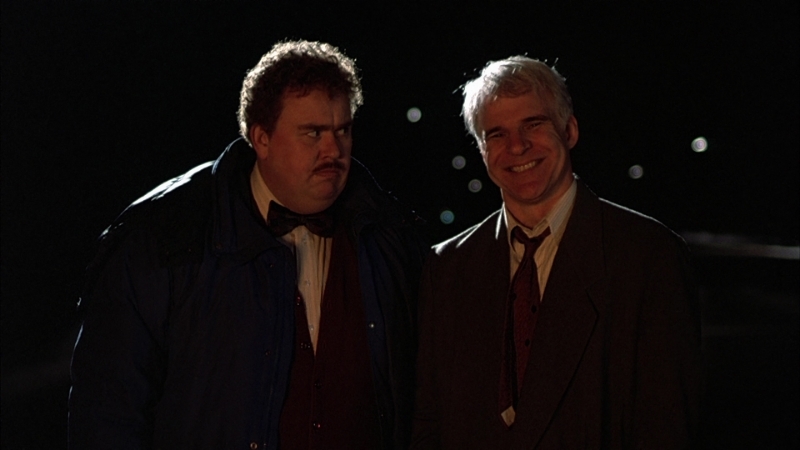 As with essentially all of his films at that time and more specifically, at this point in my life, "Planes, Trains and Automobiles" was another pivotal episode in Hughes' then on-going filmography. I reflected that his films provided me with a sense of a road map. "Sixteen Candles" was released when I was 15 years old and "Some Kind Of Wonderful" arrived when I was 18. His six film ode to high school and the teenage years followed me perfectly through the entirety of my high school years, all the while offering counsel, encouragement, compassion, understanding, guidance, and of course, copious amounts of beautifully observed and realized humor, as if Hughes himself was my prized and most beloved teacher for he aided me tremendously in my journey of self-discovery and a growing world view. John Hughes was the finest creative figure during that specific stage of my life and even as I look backwards in time, I still feel so committed to this feeling of reverence and respect for this man, whom I never, ever met or knew personally, who indeed was an indispensable influence and source of inspiration. For those six films, Hughes was catching me right where I was in my growth and development. With "She's Having A Baby," (the film which was designed to follow "Some Kind Of Wonderful" in June 1987 as the thematic bridge from high school characters to adult characters but whose release was delayed due to a Director's strike) and then "Planes, Trains and Automobiles," John Hughes was in the position of showing me what came after high school, and I was anxious to become immersed in his perspective. I first saw "Planes, Trains and Automobiles" on its opening day in November 1987 when I was 18 years old. I was nearing the end of my first semester as a college Freshman at the University Of Wisconsin-Madison. On the morning of the day I returned home to Chicago for Thanksgiving break, I continued my daily ritual of going to the faulty Chicago Tribune newspaper box located at the Lakeshore dormitories, where I would pound on the box one or two times, after which the door would open without effort, therefore relinquishing a "free" paper for the taking (I performed this feat during all four years of college--a somewhat "Hughes-ian" trait I would think). Yet, this day's newspaper was more than prized for me be cause it would indeed contain the late, great Gene Siskel's review of John Hughes' latest film, a review I was more than anxious to read even though Siskel had been harshly critical of Hughes work aside from both "Sixteen Candles" and "The Breakfast Club" (1985), whereas his colleague/competitor, the late, great Roger Ebert of the Chicago Sun Times was typically more consistent with actual praise for Hughes' output. To my surprise, Siskel's assessment of "Planes, Trains and Automobiles" was highly positive as were Ebert's, and one from USA Today that I quickly read at the newspaper stand inside of the Stare Street Walgreen's between classes. I was excited enough to see the film, Hughes first foray into adult territory as a director and with no less then comedy giants Steve Martin and John Candy in the leading roles of this R rated movie. It was practically all I could think about during my entire bus ride home on that snowy day, and certainly, I was also devising of ways to respectfully ask my very strict parents if I may see the film that evening. Thankfully, they granted me my wish, drove me to the Ford City movie theater--the location where I had seen "The Breakfast Club,""Weird Science" (1985), "Ferris Bueller's Day Off," and "Some Kind Of Wonderful" over the past two years--and there I sat, on opening night, Thanksgiving eve, with hardly anyone else in the theater with me. In a way, it almost felt like a private screening and I was about to be let in upon a terrific secret. "Planes, Trains and Automobiles" stars Steve Martin as Chicago advertising salesman Neal Page, anxiously nearing the final minutes of his latest New York based business trip as he wants nothing more than to return to his wife Susan (Laila Robbins) and their three young children back in the Chicago suburbs on the Tuesday before Thanksgiving. After enduring one minor mishap after another in his attempts to simply hail a cab to make it to the airport on time--from losing one taxi in a foot race with another businessman (Kevin Bacon in a clever cameo), being relinquished of $75 to a merciless attorney for purchase of another taxi to falling over a large trunk into the street and having said taxi inadvertently taken away by the owner of the trunk--Neal finally arrives at the airport to discover a building snowstorm has caused a flight delay, making his return to Chicago longer than expected. 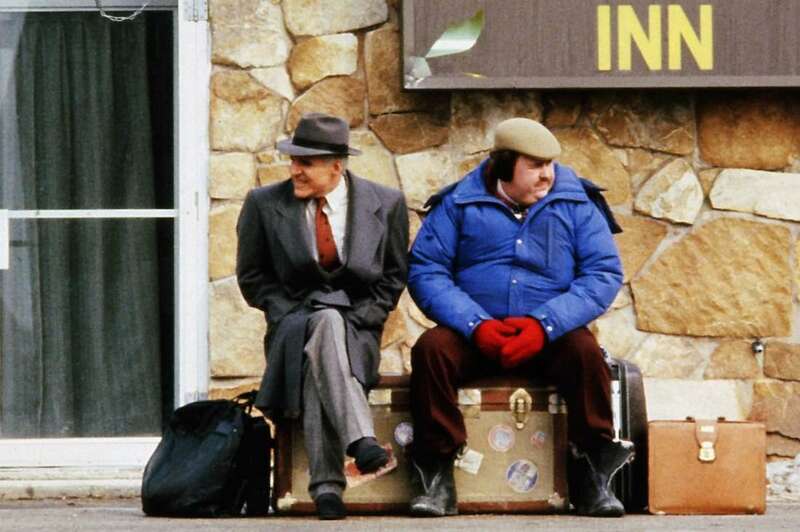 While waiting to board upon the next scheduled flight, Neal meets the owner of the trunk, Del Griffith (John Candy), a travelling salesman who specializes in shower curtain rings. Del, while gracious to a fault, is precisely the type of figure the fastidious Neal wishes to remain as far away from as possible. Obnoxious, overly talkative, and filled with a barrage of personal space invading bad habits that drive Neal to his breaking points, Del Griffith is that veritable bad penny that Neal Page just cannot rid himself of during an odyssey that takes the pair to a re-routed flight to Wichita, Kansas, derailed train trips, a bus ride to St. Louis, hysterically catastrophic rental car escapades, all manner of seedy motels and more. Yet, the arduous journey leads both Neal and Del to a greater understanding of each other, themselves and most importantly, within the film's final, crucial and surprisingly devastating revelations and supremely warm hearted conclusion, the true meaning of Thanksgiving. 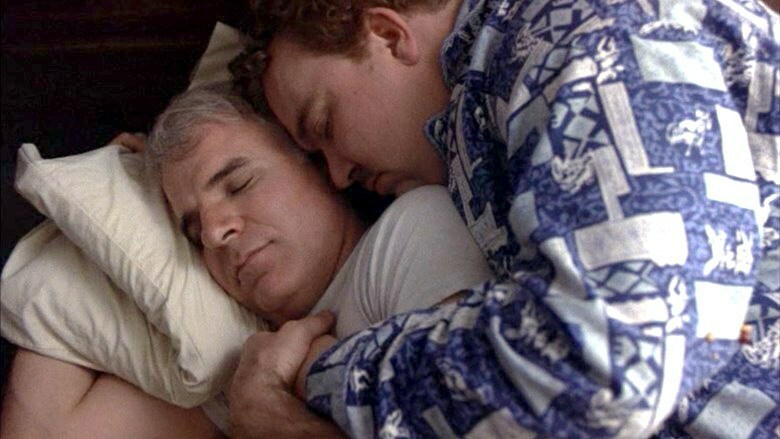 As previously stated, "Planes, Trains and Automobiles" found John Hughes operating in peak creative form and to that end, both Steve Martin and especially, an undeniably heartbreaking John Candy, elicited performances that neither of them had previously achieved at that time. 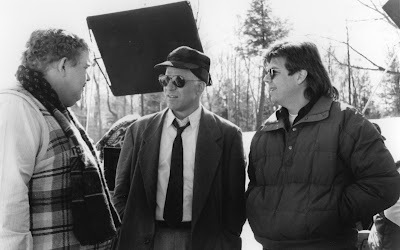 Their chemistry was as ingenious as Hughes' writing and directing, making the trio an unstoppable creative force that I wished could have found another opportunity to work together again. For you see, John Hughes delivered the creative goods to his stars with a full, complete story with two richly devised characters speaking Hughes' priceless, endlessly quotable dialogue that was grounded within a certain, approachable reality that allowed the comedy to strike to an often screamingly funny degree. Hughes was decidedly not the kind of comedy filmmaker who felt that if he just turned the cameras on, a script was unnecessary and Martin and Candy would just inherently "be funny." Hughes gave Martin and Candy an entire cinematic universe to immerse themselves with, wich allowed them to play to their strengths as they unearthed talents previously unseen. For Steve Martin, the once "Wild and Crazy Guy," we were given the opportunity to witness him not just playing the "straight man," but the upper middle class Midwestern family man (i.e. the audience stand-in), whose devotion to his wife and family plus his determination to arrive home for Thanksgiving as promised provided the character of Neal Page with a specific, serious core from which his escalating frustration and often explosive reactions would fuel both the comedy and the drama of the film as a whole. 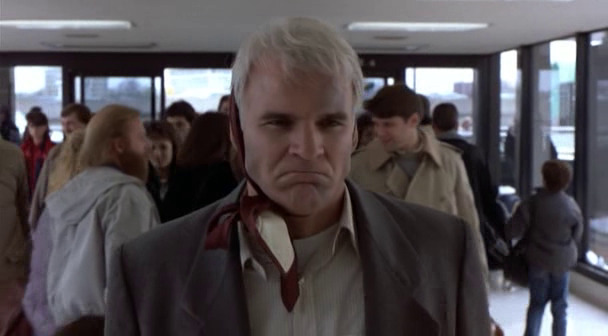 Steve Martin's trademark physical comedy was superbly elegant, from his navigation of a filthy motel bathroom and attempting to dry himself off from a shower with a tiny washcloth to his full on body temper tantrum upon discovering the car he rented was not on-site and his subsequent three mile trek back to the rental car agency where he unloads in a purple faced rant during which the mother of all profanities is uttered a whopping 19 times. Every single moment in Martin's excellent performance served the character which he played to perfection, making Neal Page not simply an extension of Steve Martin or even John Hughes, but a recognizable figure we could relate to, for better or for worse--especially when we are travelling. 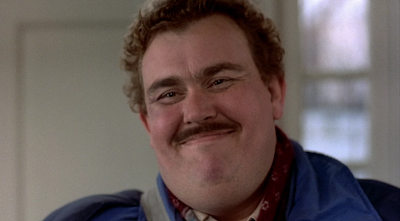 As Del Griffith, John Candy was a revelation. As with Steve Martin, he possessed a verbal and physical dexterity that felt to be tailor made for John Hughes' stories, as evidenced by their continued collaborations afterwards. Yes, his comedic display was marvelous, especially during essentially every single section of Hughes' undeniably and brilliantly constructed extended rental car highway sequence, from dancing to Ray Charles' "Mess Around," to battling the confines of his imprisoned parka to all of his mannerisms while driving in the wrong direction to his post-near car crash reactions ("Well, we can laugh about it now. We're alright."). But, what made his performance so remarkable was how deeply he mined the depths of Del Griffith's existential anguish. Now, even though we are dealing with a film that is 30 years old, I will not produce any spoilers here. But that being said, from his private monologue while seated in frigid weather inside of a burned out rental car to the film's final scenes, John Candy gave us a character that punched our hearts so hard and honestly, that we ached...and all the while never sacrificing the comedy. It is a performance that, to this day, I felt deserved an Oscar nomination. 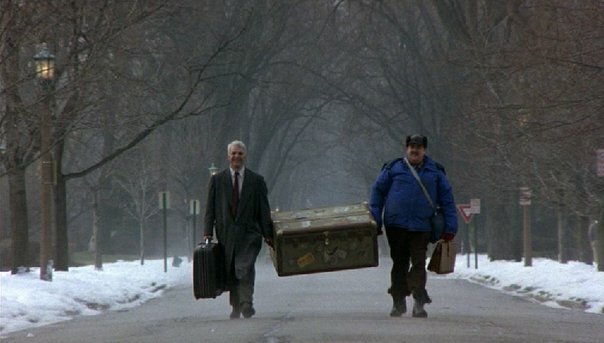 There was no question that I loved "Planes, Trains and Automobiles" on that very first viewing but it was indeed John Candy's performance and those final moments that truly stuck with me as I left the theater and ruminated over it while at home afterwards and over Thanksgiving dinner as well. I saw the film for a second time on that Friday evening, along with a treasured friend from high school, at Chicago's Water Tower and this time, the theater was packed full and filled not with teenagers but people who were mostly middle aged to varying degrees. By the time, the film reached its conclusion, there was not a dry eye in the house...except for me and my friend, who were possibly the youngest people at this particular showing. It was a moment that has firmly etched itself into my memory of seeing John Hughes movies as they were first released in theaters and this reaction was definitely a powerfully potent one. John Hughes' "Planes, Trains and Automobiles" has long cemented its reputation as being a first rate adult comedy film without question as it merged the road film, and "odd couple" buddy comedy masterfully. We know how funny it is and after 30 years, like many of Hughes' best movies, the film has aged exceedingly well as it is indeed a perfect piece of pop culture from its late 1980's time period yet Hughes also ensured that his work would remain as timeless as possible as well as serving as a personal and even artistic statement (although Hughes himself would most likely have downplayed any loftier accolades to the point of dismissal). For his output during that period, the film seems to have been as personal as any of his teen films and most definitely, the essentially autobiographical "She's Having A Baby." Hughes' Father and Grandfather had each worked in sales and furthermore, the original idea for "Planes, Trains and Automobiles" surfaced from John Hughes' own experiences working in advertising at the Leo Burnett corporation combined with his moonlighting business trips between Chicago and New York writing for National Lampoon. One such experience had Hughes and a colleague stranded in Wichita due to a snowstorm making him unable to return to Chicago for five days but thankfully, his experiences were nothing like anything that Neal and Del were forced to endure. It was the first film of Hughes' in which he indulged his love of holidays, something that essentially became a sub-genre with in his oeuvre. In features ALL written and produced by Hughes, he delivered "National Lampoon's Christmas Vacation" (1989), as directed by Jeremiah S. Chechik, the Chris Columbus directed box office behemoths' "Home Alone" (1990) and "Home Alone 2: Lost In New York" (1992) and Director Les Mayfield's melancholic yet classy remake of "Miracle On 34th Street" (1994), each film set at Christmastime. Furthermore, and like "Planes, Trains and Automobiles," the undervalued, palpably sad, angry and very effective "Dutch" (1991), as directed by Peter Faiman revolved around Thanksgiving. Yet, "Planes, Trains and Automobiles" felt to feature John Hughes at his most idiosyncratic, just as with his teen films, from its inventive visual aesthetics to his impeccable choice in left-of-center songs which ran the gamut from British synth pop, blues, country and alternative rock and all held together perfectly with frequent Hughes film composer Ira Newborn's wildly diverse score as the glue. And most importantly, Hughes' gifts as a comedic writer were especially sharpened, not just with his gift for dialogue but in overall construction and set ups. For instance, one nearly throwaway moment featuring Neal Page and Del Griffith's credit cards at the Braidwood Inn in Wichita early in the film does not actually receive its full payoff until the conclusion of the extended rental car highway sequence late in the film. We never see it coming and with all of my subsequent viewings of the film, I am repeatedly amazed with how carefully Hughes set up every moment so everyt hing would reach its greatest effect. Aesthetically, the film represented John Hughes in an especially playful mood yet a meticulously detailed one as no major travel companies, from airlines, bus companies and train lines would allow themselves to be represented in the film for fear of negative backlash in the real world. So, Hughes and his filmmaking team had to invent them all, augmenting the already (yet quietly) composed fictional Chicago suburb of Shermer, IL., thus creating a film universe that was as seamless and as detailed as anything we experience in the real world. Bit players and supporting actors from previous Hughes films all popped up in various places during "Planes, Trains and Automobiles," most notably the terrific Edie McClurg as another one of Hughes' bubbly yet savvier than she appears support staff characters. And again, I have to mention Kevin Bacon's cameo, as I wondered if he was actually reprising his role of Jefferson "Jake" Briggs, his Hughes alter-ego character from "She's Having A Baby," in a most rascally state of mind as he races Neal Page for a prized taxi cab near the film's opening. To that end, what movie is Neal's wife watching on television as she sleeplessly waits up for Neal? Answer: "She's Having A Baby"! It actually makes me sad that John Hughes never received the credit that he was more than due in regards to the cinematic world building that the likes of Quentin Tarantino and Wes Anderson are celebrated for today. Honestly, John Hughes must be given full credit for the creation of the larger cinematic world of "Planes, Trains and Automobiles." 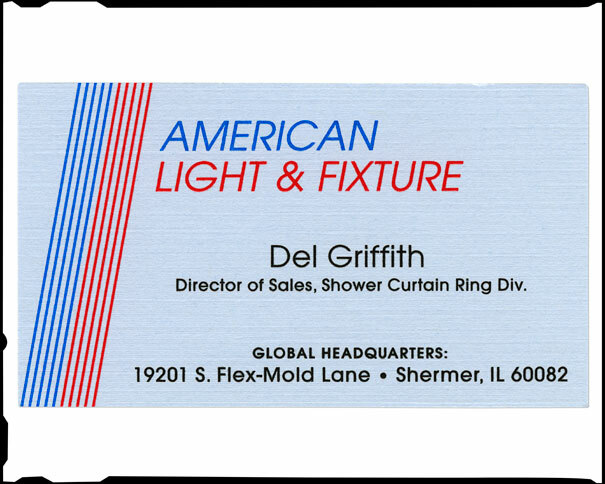 This was Hughes operating at an even higher level of invention and construction--all the way to Del Griffith's ridiculous pajamas, which hysterically matched the drapes and bedding covers from the Braidwood Inn and even his business cards! No stone was left unturned in Hughes' artistic vision. For so much of his film career, Hughes' construction of the characters and locale of Shermer, IL was innovative to say the least, all the while inventing a larger film universe that jointly represented the world as it is alongside the world Hughes may have wished for it to be. With "Planes, Trains and Automobiles," John Hughes took the "snobs vs. slobs" aesthetic of so many film comedies of the 1980's and injected a healthy and hefty amount of palpable insight and soul into the proceedings, making the life lessons of the characters truly earned moments which audiences could be affected by. Recalling my second viewing of the film at Water Tower and gauging my reactions towards the film 30 years later, at the age of 48 and after countless viewings, what truly amazes me even more after all of this time is how astute, precise, and even devastating the movie truly is as what we have is the story of two very sad men, in the middle years of their lives, thrown together and forced to help and understand each other. And I would gather even further that with John Hughes as the film's creator, perhaps "Planes, Trains and Automobiles" is the story of three very sad men and perhaps, with the film's life lessons, we were witnessing were the figure of Hughes was delivering messages to himself as well. 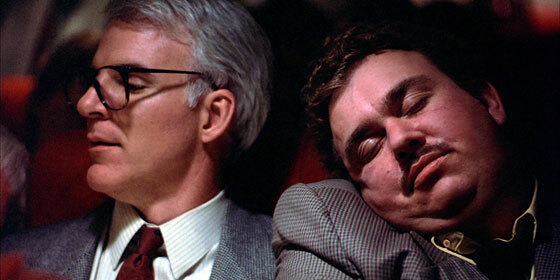 In addition to the framework of the road and buddy comedy formats, "Planes, Trains and Automobiles" serves as a perceptively observed comedy of manners with regards to culture shocks and class divisions. Yes, Hughes has some nasty fun with his rural characters including the pig grunting Owen (Dylan Baker) and his wife (Lulie Newcomb), whose firstborn "come out sideways," but his greatest criticisms are sharply aimed at his main protagonist Neal Page. Neal Page has certainly worked his way to his particular station in life but to that end, he is indeed a man of considerable privilege, as evidenced by his Shermer, IL home and more pointedly, the sleekness of his occupation, and his wardrobe, most likely purchased at Neiman Marcus (hence one of his credit cards), which includes his sharp fedora and the telling wrist watch, which perfectly suggests how much he is tethered to the constructs of time itself. Like the character Tom Hanks portrayed in Robert Zemeckis' "Cast Away" (2000), time defines Neal Page, as much as his personal proclivities and his economic status yet the journey of "Planes, Trains and Automobiles," forces him to confront some dark truths about himself and his life: that time is rapidly slipping away from him and the relationships he holds dearest and his self-absorbed nature will not do him any favors within navigating the larger world. Certainly, we can gather some level of tension in the relationship between Neal and his wife Susan, who in addition to worrying about his travels back to Chicago, at one point even suggests a level of distrust with a pointed "Neal? What's going on?" --a tension that the highly intuitive Del Griffith could detect instantly with his equally pointed question, "Trouble on the homefront?" During a restaurant conversation in a St. Louis diner, Neal, mentally kicking himself for missing his daughter's school Thanksgiving pageant, laments to Del that he has been spending too much time on the road, which indeed cuts to the core of the character. He has spent his adult life working diligently to provide for the very people he rarely sees, a quandary that not only explains his pain but also his impatience, intolerance and anger. It is as if he, like so many of us, desperately wishes that he could control time itself so that he could have more than enough to be available to work as well as to have more than enough to spend with the people he treasures most. The film showcases what happens when Neal Page is reminded that he is completely unable to control time and through the collaboration of Hughes and Martin, we are witness to a beautifully simultaneous slow boiling meltdown that fumes with rightful and self-righteous frustration and is released with downright honest hilarity. For a man who wishes to be in control, "Planes, Trains and Automobiles" deftly illustrates just how out of control Neal Page actually is. Yes, in regards to his wrestlings with time. but, more pointedly, his relationships within the social class structures of those who operate above and below his own pay grade, because in the real world, his level of privilege gets him absolutely nowhere. Neal Page possesses no street smarts whatsoever as he is foiled over and again from that aforementioned attorney of a higher economic status who haggles $75 from him for a taxi to all manner of everyday working class characters who one-up him consistently and constantly. He ingratiates himself to no one, presents himself as if the world owes him favors he has not legitimately earned and he is routinely pummeled for it...sometimes literally! "This is the scene where Neal Page (Steve Martin) unleashes his long pent up rage at Del Griffith (John Candy), who stands there, takes it all, does not crumble and asserts his individuality. It is a scene that would almost be too painful to endure if Neal's viciously cruel rant was not also so savagely funny. What takes this sequence to the next level is how Hughes occasionally cuts to the face of Del Griffith, where we can have a few moments to witness his pain and hurt feelings at the other end of Neal's harshness. It deftly transforms the sequence into a social lesson and depicts how the sadistic rules of the playground exist well into middle age. This is the scene that not only raised the acting stakes and bar for Martin and especially Candy, but it also elevated this film from terrific comedy into something much deeper and memorable." In fact, as I just re-watched this scene days ago, I was struck by how much I actually didn't laugh this time around and was instead drawn in by the brutality, and ultimately, the strength of Del Griffith, a painfully awkward, deeply lonely man who somehow houses an exceedingly impressive stamina that keeps one foot marching in front of the other and a sense of steadfast optimism where so many of us would crumble to pieces. Where Neal Page screams to the universe, "You're messing with the wrong guy!! !," we see that he is easy pickings. 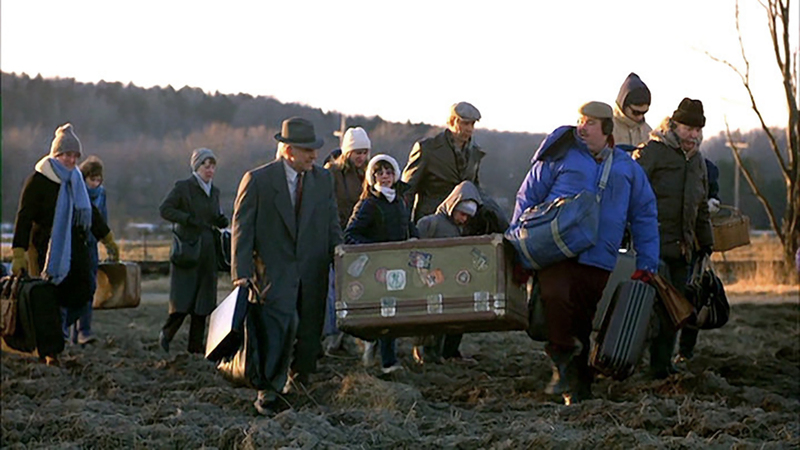 Del Griffith, on the other hand, will always get to his destination...that is if he even has one. Yes, I did indeed promise to not produce spoilers, even for a film reaching its 30th anniversary, and I will do my best to as not to reveal more than necessary when exploring the character of Del Griffith, a figure w ho provides the film with its central mystery, so to speak, as well as its tremendous soul and considerable sense of tragedy. The final moments of "Planes, Trains and Automobiles," when all is fully revealed to Neal Page (as well as to all of us in the audience), I am still hard pressed to find anyone, anywhere who has not been shaken and emotionally shifted to a hefty degree, especially within a film during which we had been laughing so constantly. It is simply that all of the elements concerning Del has snapped into place for us in regards to Hughes' storytelling and how we regard our own lives. For instance, take the placement of Del Griffith's trunk, which arrives somewhat innocuously (but painfully for Neal) in the film but ultimately becomes a towering symbol by film's end. Literally and figuratively, the trunk is indeed Del Griffith's entire life and the immense baggage he shoulders every day of every year. Even further, the trunk represents the baggage that Neal Page shoulders every day of every year, as well as for us in the audience and what Hughes depicts via Neal's transformation is his at first reluctant, then tentative then fully empathetic reach towards Del to shoulder the baggage together in friendship and community, for no one should navigate the world completely alone. The aloneness of Del Griffith, even as I write about it, just touches me in a way that I am finding difficult to describe. Maybe because the feelings are primal in its painful existentialism. Despite his occasional vulgarisms (from crude expressions to bodily functions to his horrific treatment of motel bathrooms) and obnoxiousness, Del Griffith, armed with his street smarts combined with his considerable charm, his ability of fully knowing and engaging with his audience, and his general overall decency, he has built the ability of ingratiating himself to people all over the country. Unlike the prickly Neal Page, Del Griffith is an accepting individual of all people, regardless of class or status, and that makes him a warming and considerably convincing presence even when he is hustling for money in order to return to Chicago (I absolutely love the montage of Del selling his shower curtain rings yet passed off as "Walter Cronkite moon rings," "autographed Daryl Strawberry earrings," "Czechoslovakian ivory," etc...). Yet, there are two major factors regarding his complete nature that does indeed strike at the core of his being: He knows himself well enough to realize that he tries too hard when he finds himself truly enjoying another's company, potentially ruining a friendship before it has even begun, which then leads me to my second realization...Del Griffith does not have any friends. Frankly, Neal Page is someone who strikes me as one who does not really have any friends either. Yes, he has work associates and colleagues but those are not friends. I also gather that he may be a fine neighbor in his community but perhaps a somewhat distant one, having no close relationships with anyone outside of the sanctuary of his home and family, a place and people he rarely sees due to the demands of his career. Where Del's baggage, in the form of that trunk, is as visible as the heart upon his sleeve, Neal's baggage is distinctly cloaked but arrives in often misguided, misplaced fury. By the time the twosome begin to make some strides towards each other, and definitely by the film's emotional climax, the story of Neal Page and Del Griffith feels like the song "The Weight" by The Band as they each take a load off of each other to help carry the weight equally. And what of John Hughes himself? In many ways, so little is really known about him personally. But from what I have been able to gather after all of these years is that he was a uniquely gifted writer and filmmaker within an industry he was most likely not tailor made. He enjoyed working with actors but felt a distaste for the Hollywood industry and executives. His ego was incredibly fragile although he was never precious about his own material regarding on-set improvisations, script re-writes and the changes made in the editing phases. He was a tremendous wordsmith on the page, eloquent during interviews yet possessed difficulties communicating with his crews and over the course of his Hollywood years, his rage and tantrums are now legendary. I have always wondered just what may have happened to Hughes over his Hollywood years, why he became consumed with such anger and why he abruptly departed from making films altogether. And now, as I have watched "Planes, Trains and Automobiles" again, I am wondering if Neal Page and Del Griffith are actually two sides of the John Hughes coin, so to speak. John Hughes could be considered to have been a workaholic as the speed of his output can attest, where he would typically have one film in theaters, while the previous film would arrive on home video formats and a third film was in pre-production all at the same time. His late night writings, while chain smoking and blasting music are also legendary as well as the rapid nature at which he produced completed screenplays ("Planes, Trains and Automobiles" was reportedly written in a mere three days). Yes, John Hughes' work ethic is sound and completely responsible for his success, wealth and legacy. But even so, it seemed that what he wanted most of all was to simply write his stories and be left alone in the sanctuary of his family. By all accounts that I have ever read of the man, his wife Nancy Hughes and his two sons, James and John III, were nothing less than sacred to him. His love of Chicago was also unshakable. For a spell during the mid 1980's, his peak period of creativity, Hughes was essentially forced to movie his family from Illinois to California, a move he always resented and ultimately, felt uninspired by. While I will never know about how much time he was away from his family while making movies, I do wonder if having two-year breaks from directing between "Planes, Trans and Automobiles" and "Uncle Buck" (1989) and "Curly Sue" (1991) as well as ceasing his directing duties entirely after 1991, it was a way to keep himself at home with his family and writing instead of dealing with the maelstrom of on-the-set movie making. In the case of the actual filming of "Planes, Trains and Automobiles," everything that I have ever read over these past 30 years have expressed that the shoot, which involved working and acting in routinely bitterly cold temperatures and the chasing of the ever elusive snow, has described the creation as nothing less than hellish and Hughes' reportedly grouchy, acerbic behavior on-set certainly did not help at all. It's one thing to become lost in creation while in the solitary act of writing but to make the story live and breathe and walk around via the aid of hundreds upon hundreds of other individuals who may not be as invested as yourself, that is another story entirely and could make for a miserable existence. I also wonder if John Hughes, like Neal Page and Del Griffith, suffered from a lack of friends, something that he seemed to crave. It is well known how closely he bonded with both Molly Ringwald and Anthony Michael Hall once he bean directing his screenplays and how devastated he was when they each wanted to move onwards creatively (yet Hughes took it personally-essentially not speaking to them again). 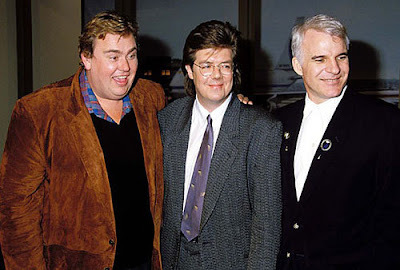 With each new project, he attempted to forge new relationships with his actors and some behind the scenes participants, but none seemed to connect in the way he wished until John Candy entered his life. The friendship of John Hughes and John Candy was a powerfully deep one as some reports and articles have suggested they were as close as brothers, as they devised new projects together and spent hours upon hours talking on the phone and bringing their respective families together as well. It has also been suggested that John Candy's death from a heart attack in 1994 may have been the final straw regarding Hughes' relationship with Hollywood and his decision to leave it altogether. I think that knowing even the little that I know, it would be difficult to think that none of the pathos of his real life did not find a way into his films. With John Hughes, the very best of his work contained more personal details than he was ever willing to fully admit, if at all. And in doing so, it feels right to think that whatever conflicts that faced Hughes during the process of creating "Planes, Trains and Automobiles" weaved their way into the narrative, whether consciously or not, making it all the more incredible to witness what a fall down hysterical yet beautifully bittersweet film the film actually became. Perhaps this is the road map that John Hughes' "Planes, Trains and Automobiles" has placed in front of me, a map that I am still attempting to decipher as well as follow. The film represents a map that transcends one's age but speaks directly to it as the middle point of life sees one looking backwards as much as looking forwards, with the knowledge and understanding of mortality being more apparent than in years past. "Planes, Trains and Automobiles" is a dual journey of two, lonely middle aged men in the throes of constant travel--one constantly in motion for the purposes of maintaining the very family he rarely sees, the other constantly in motion in attempts to outrun his own private pain--made by a then younger middle aged man in constant motion, moving as fast as his brain could think up stories and his hands could type them...yet, all for what if the experience ate away at him. Neal Page, Del Griffith and John Hughes, all salesmen, all possible echoes of the fictional Willy Loman from Arthur Miller's "Death Of A Salesman" (1949), all experiencing a sense of being adrift in a cold, unforgiving world only to find each other at the very holiday designed for the grace of community and the warmth of communion. And to think, all of this from a comedy. MAN OUT OF TIME: a review of "Roman J. Israel, Esq." At this time, we have a case where the performance far outranks the movie. In the promotional trailers for "Roman J. Israel, Esq.," the new film from Writer/Director Dan Gilroy, I was happily intrigued, partially due to the odd, throwback appearance by Denzel Washington and partially due to the fact that the trailers smartly did not give away any pertinent information regarding precisely what the film was even about--unlike most trailers these days which seem to be more than happy to deliver a truncated version of the entire film they are advertising. For this film, it was a promotion that made me lean forwards in high curiosity as I wanted to know just who Washington was portraying and what was this person experiencing. Now having seen the finished film, I am underwhelmed. Again, we have a film this year that is not necessarily a "bad film," so to speak. I deeply appreciate the effort of Dan Gilroy in creating a character unlike one that I really have seen and I am more than thankful to have been witness to Denzel Washington deliver yet another fully lived in, three dimensional, award caliber performance, again reminding us that he remains a national treasure as he is one of our finest American actors without question. What is disappointing, however, is that "Roman J. Israel, Esq.," is a thematically complex, adult themed film that is ultimately one that is not terribly involving, making for an experience that feels to be almost in conflict with itself as the film feels to be at arms length while the performance of Denzel Washington is fully engaged, unique and powerfully magnetic. In keeping with the spirit of the film's trailers, I will try to keep the plot description brief. Denzel Washington stars in the titular role of "Roman J. Israel, Esq." an idealistic defense attorney and legal savant in the over-burdened Los Angeles legal system who has spent his adult life working as the "behind-the-scenes" half of a tiny two partner law firm. When his law partner, a civil rights icon and who was also once Roman's law professor has a heart attack, Roman is soon recruited by the high-powered attorney George Pierce (an excellent Colin Farrell) also another of the famed professor's former students, to join his firm. Additionally, Roman begins a tentative relationship with Maya (Carmen Ejogo), a younger civil rights activist. Through a series of events which rise in their turbulence, Roman's life is upended as he is forced to make moral choices that just may run in conflict with the activism and ideals that have defined his life's purpose. While the film does indeed contain some elements of a crime thriller here and there, Dan Gilroy's "Roman J Israel, Esq," is not a film driven by its plot. What we have is a detailed character study of a man confronting and rolling the dice against his own moral barometer and facing the consequences of his actions which may or may not run against every piece of who he has built his life becoming and believing himself to be. It is a quieter film. A soulful film that possesses moments of tension, sequences of intensity but it is not a cinematic pot boiler whatsoever. This is not a criticism. It is just a description of the type of film it is should you choose to see it for yourselves. 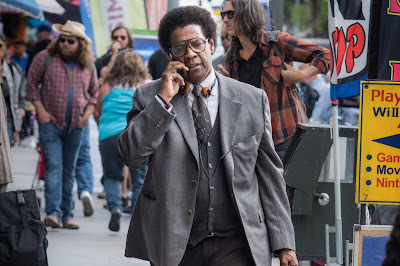 The very best element of the entire film is the performance by Denzel Washington as Roman J. Israel, Esq., as he announces himself to every character he meets within the film that bears his name. On a pure visual level, I am unable to recall a film where Washington has ever appeared like the character he portrays this time, a figure who looks as if he is a relic from the early to mid 1970's--from his archaic clothing to his over-sized out of date glasses, to his large, natural afro--transplanted into 2017. Even with Roman's only concessions to modern times, from his cellphone to his ever present headphones and I-pod, which contains some 8000 songs, all of which are politically minded soul and funk selections, are augmented and therefore stamped with the ghosts of his past. Yes, Roman's appearance is clearly a reflection of his activist spirit but what feels deeper to me is that the character's own soul as a human being feels as if it has not evolved past the civil rights struggles of the 1960's and 1970's. And so, in the 21st century, he carries onwards like a Don Quixote figure, navigating the world fully against the grain, embittered by what he feels to be a societal (yet specifically an African-American) disregard (or even dismissal) for the civil rights battles of the past and present. Essentially, Roman J. Israel, Esq. shoulders himself with a idiosyncratic brand of integrity that the world clearly is not remotely interested in or even desires. So, over the course of the film, Roman is presented with a moral choice, a challenge not only to his integrity but to the moral arc of the universe's sense of justice as he perceives it to be. And in doing so, Dan Gilroy's "Roman J. Israel, Esq." is a journey of what happens to a man when he takes this cosmic roll of the dice. With Denzel Washington's performance, we again ware witness to a Master Class of acting from the inside out, where we actually do not observe Washington acting, per se. We regard Denzel Washington in a state of becoming and therefore, being. How incredible to watch Washington in a role that is worlds away from the furious and ferocious swagger and bombast from the outstanding "Fences" (2016) just one short year ago. With "Roman J. Israel, Esq." truly regard the man's posture, his gait, his paunch. The way he seems to be folded over and crumpled. How his insecurities feel decidedly childlike and all-knowing to an adult late in life who has long carried a certain amount of baggage. The matter-of-fact nature of his own self-perception, from attributes to his failings is often disarming in its directness. And then, there is even yet another layer to consider to this character and Denzel Washington's performance. While there is not a moment within the film that specifically addresses the concept, Denzel Washington has proclaimed in interviews that his character is someone who is highly functioning on the Autism spectrum. But rest assured, what we are given is nothing like what was seen in "The Accountant" (2016)! Trust me, there is not one moment in "Roman J. Israel, Esq." that is remotely pulpy. But the autism of and within the character of Roman gives us yet another window to look through as we regard him and how he views the world in which he exists. And in doing so, we are given a more precise look into a man's sense of alienation, isolation, idealism, virtuousness, bull-headedness, reserve and resolve and even his own sense of paranoia. In doing so, Denzel Washington is miraculous on every conceivable level. 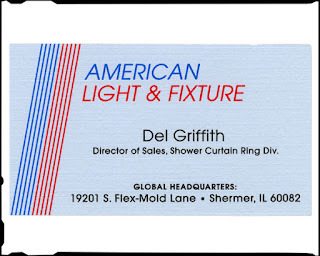 Sadly, Dan Gilroy has not given this most unique character a story that could serve as his equal. Yes, I am more than thankful that Gilroy has created an original film that is unapologetically made for adults. But that being said, being original and unapologetically made for adults does not necessarily equate itself with being dry and drowsy. And unfortunately, even Denzel Washington's outstanding performance cannot single-handedly lift this film from being restlessly dry and as drowsy as a mid Sunday afternoon nap on the couch. Certainly, I had no need for Gilroy to jazz up the proceedings. To generate prefabricated and overcooked material and approaches that would have undercut the integrity of his film. But as it is, I wished there was some sort of fire in the belly. In many ways, "Roman J. Israel, Esq." reminded me greatly of another corporate drama/thriller that left me cold initially and that film happened to be the George Clooney starring "Michael Clayton" (2007), which was incidentally written and directed by Tony Gilroy, Dan Gilroy's brother! That film was also one on first view, I appreciated for its adult nature but it did leave me cold. It was only during a second viewing where the pieces snapped into place, thus revealing a work of excellence. Perhaps "Roman J. Israel, Esq." is also that kind of a film, the type that does not fully reveal itself the very first time. Who knows? Maybe one day when the film reaches cable television, I may pull it up again and see if my reaction remains the same or otherwise. But for now, all I can go on is what the film left me with as I exited the theater. A sharp character study fueled by a performance that demands the fullest of your attention that is trapped in a movie unable to keep it. THE GOOD, THE BAD, THE CHILD AND YET ANOTHER APOCALYPSE: a review of "The Dark Tower"
To the fans of The Dark Tower novels, Stephen King's eight volume post-apocalyptic/science fiction/western/fantasy series, I feel your pain. Dear readers, believe it or not, before this year, I have never read a novel by Stephen King. Yes, that is true! For as much as I have read in my life and for how prevalent Stephen King has been and most certainly remains at the forefront of pop culture and best selling literature, his work has not crossed my path. Not for any real reasons that I can honestly think of, but.King's bibliography has just been something that I was never really that inspired to read, until very late this summer as I was inspired to try and give one of his novels an honest try...the mammoth one thousand page plus Dickensian tome entitled It (1986). What inspired me to read this particular Stephen King novel was indeed the excellent film adaptation from early this September by Director Andy Muschietti. As I have been reading the book (in which I have just about cracked to 400 pages so far as of this writing), I have found myself tremendously impressed with King's prose, which possesses a 19th century quality in the level of the language contained in the meticulous details, history, characterizations and stories within stories of the children from Derry, Maine who band together to defeat the relentless entity of Pennywise the Dancing Clown and join forces once again as adults nearly 30 years later. Having seen the film version and knowing a second installment will arrive in two years time, I am even more amazed that Muschietti and his screenwriters have been able to distill such a dense narrative so cleanly at all into one coherent film let alone for the planned second film. For what I loved about "It" was indeed the characterizations, so crucial and essential to ensuring the horror of the piece was truly terrifying. For it would have been so easy for Muschietti to make a swift, 90 minute film of pure shocks and nothing else and call it a day...but he didn't. He took the time, patience and creativity to take King's behemoth novel, crack it's code, and devise a way to tell the story visually and with an emotional depth to make the story resonate as powerfully as possible. And so, we do arrive at the first film adaptation of "The Dark Tower," as directed by Nikolaj Arcel, a film that was critically panned and faced a rapid box office death at the end of this summer...and just a few mere weeks before the arrival of "It," the critically acclaimed, box office smash. Believe me, I do understand how fans of the book series could have felt so demonstrably let down by the results of this film. "The Dark Tower" stars Tom Taylor as Jake Chambers, an 11 year old mourning the death of his Father and is also plagued by apocalyptic nightmares involving desert wastelands, figures with scarred faces and the eternal evil entity named The Man In Black who wishes to destroy the titular tower, the monument that protects the entire universe from endless darkness. Jake chronicles the images from his dreams into his sketchbook, determined to discover the meaning of these images, although his Mother (Katheryn Winnick), step-Father (Nicholas Pauling) and therapist (Jose Zuniga), dismiss everything as existing as mere dreams. Jake soon discovers that his visions are indeed real when he narrowly escapes from two monsters disguised in human skins, travels through a portal into the desolate parallel universe known as Mid-World where Walter Paddick a.k.a. The Man In Black (a strong Matthew McConaughey) malevolently schemes to end existence, and the taciturn Roland Deschain the Gunslinger (the imposing Idris Elba) remains his eternal adversary in their endless battle of good vs. evil. Joining forces, Jake and the Gunslinger voyage between the worlds of modern day New York City and the barren landscapes of Mid-World to track down and stop The Man In Black from destroying existence in all of its forms. With that plot description, and just from pure face value, I found Nikolaj Arcel's "The Dark Tower" to be kinda nifty. Arcel, working with Cinematographer Rasmus Videbaek, establishes a crisp, sharp visual palate where the real and surreal converge in a fever dream styled aesthetic that suggests an amalgamation of a Sergio Leone spaghetti Western merged with elements that could be found within the films of Terry Gilliam, Christopher Nolan and even some of the psychological demons come to viscious life in Adrian Lyne's "Jacob's Ladder" (1990). Essentially, Arcel's adaptation is a chase film, a constant race against time structure and pacing that does indeed lend itself to that aforementioned fever dream quality which also augments the mental state of young Jake Chambers as he struggles to understand and soon navigate the world of his dreams which ultimately reveal themselves to being real. Both Elba and McConaughey appear to be having fun with their respective roles, instilling each with the proper levels of smoldering gravitas and sinister abandon, respectively, ensuring that both characters are ones that we would be willing to follow within an adventure such as this one. And yet, with all that I did like as I watched the film, once it was all over, the proceedings did feel to be rather anti-climactic and even disposable to a degree as all of the sound and fury really did not add up to very much and those strong, archetypal characters and performances were unquestionably undone by the weakness of the screenplay (penned by four writers?!) which, for reasons, I am unable to comprehend, completely eschewed with any sense of character development in favor of a relentless pace and one series of shoot-outs after another. Again, I did not hate this film and perhaps, whatever minor disappointment I felt with the film was due to the fact that I had no pre-conceived expectations for the film as I have not read even one word of Stephen King's book series, which I must repeat consists of eight volumes--more than enough pages, which I am certain contain considerably much more than gunfights and copious amounts of shattered glass. 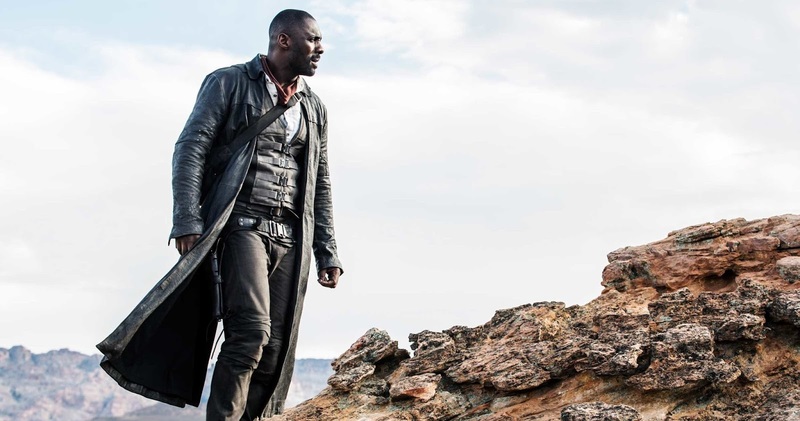 Since Nikolaj Arcel's "The Dark Tower" truthfully is not much more than gun fights and shattered glass, I can see why fans of the series felt let down, to say the least. Yes, there is quite a lot to "The Dark Tower" that feels generic, run of the mill and downright commonplace as we are indeed given yet another tale of good and evil and an impending apocalypse that must be averted and in that regard, the film is quite uninspiring as I am sure whatever idiosyncratic qualities of the source material have been stripped away in order attain some sense of mass appeal, a tactic that has obviously backfired. Think of it this way: just imagine if the Harry Potter series had been adapted for the screen and the filmmakers cleaved so much material inherent to the overall success of the books from the film version so that what remained was nothing more than a shell of what had been so beloved. Would that be something that you would embrace? I would think not. So, that being said, I have a more than strong feeling that fans of The Dark Tower book series experienced something akin to my description with this deflated adaptation, which has undoubtedly ended a new film franchise before it really could ever get off of the ground. But for the uninitiated like myself, you may find yourself kind of enjoying the running around and goings-on...that is, before absolutely forgetting you even watched it once the end credits conclude. CHOOSE KIND: a review of "Wonder"
I really did not want this to be a movie. Always with screen adaptations of literature, we run into the endless battle of whether the movie was better than the source material or vice versa, often with the attitude that the source material will forever emerge as the victor. As for me, I have never felt so strictly about this articular quandary as I have always said, books are books and movies are movies. That being said, I do find it easier to keep the two mediums separated by reading the book after having seen the film, instead of the other way around for the simple reason that if the movie that I have already conjured within my brain while reading does not match the filmmaker's interpretation, the conflict is more apparent with me. In the case of R.J. Palacio's stunningly beautiful novel Wonder, which tells the tale of a 10 year old facially disfigured boy's first year away from home in school with his 5th grade peers, the book struck me so powerfully that not only was it one of the finest I have ever read, I just did not wish for it to be visualized, especially as Palacio purposefully never went into any explicit details as to how the hero of the story actually looked, leaving every visualization up to the imaginations of every single reader. To have a filmmaker create a film where he or she would definitively define what the boy looked like felt to nearly upend what Palacio so deftly created. Perhaps this book just might be one of those books that just shouldn't have been adapted to the movies. To leave everything unseen, except for in the mind's eye, felt to be right for this story and characters. Stephen Chbosky first appeared upon my personal radar when he emerged with "The Perks Of Being A Wallflower" (2012), the outstanding screen adaptation of his own novel, first published in 1999. It was a film of such powerful empathy, tenderness, pain and truth to the adolescent experience as a whole and to the life changing and sometimes, lifeline nature of friendship and being accepted and loved unconditionally by others. When I discovered that Chbosky woud be the one to bring Palacio's novel to cinematic life, I became curious as he seemed to be the perfect fit for this specific material. Even so, I remained skeptical. Now that it has been released and I have now seen the results, I am so very happy to say that not only has R.J. Palacio's vision been enormously preserved upon the silver screen, Stephen Chbosky's "Wonder" is an achingly beautiful, richly tender, vividly empathetic and undeniably truthful film that is an entertaining as it is essential viewing for families, schools and frankly, even adults. "Wonder" is the film that I do believe that we all need to experience right now, as we are each shouldering public and private pains in a world that has only increased in its vitriolic ugliness and its shameful inability to offer any sense of understanding and compassion for anyone different than ourselves. In essence, in a world where the concept of kindness feels to be almost synonymous with "weakness," Stephen Chbosky's "Wonder" demonstrates, fully without hyperbole or manufactured situations and plot contrivances, that to choose kindness, represents one of the strongest feats any one of us could possibly accomplish. And furthermore, it rightfully earns every single tear...and I shed many of them while watching this precious film. Stephen Chbosky's "Wonder" stars an excellent Jacob Tremblay as August "Auggie" Pullman, a boy born with a severe facial deformity and who has spent much of his first 10 years in and out of hospitals, undergoing one surgery after another as well as being home-schooled by his Mother, Isabel (Julia Roberts). Regardless of the fact that Auggie loves to play video games, possesses a strong aptitude for Math and Science, harbors an especially sharp sense of humor and adores all things "Star Wars" (he even wears a short Jedi Padawan pony tail), his disfigured face is a barrier between himself and his ability to find and gain friendships. And so, to hide his face from the world, Auggie wears an astronaut helmet as a source of security and self-preservation.Yet Auggie's perceptions and day-to-day reality will soon be challenged as he enters the Beecher Prep private school for his year in 5th grade. 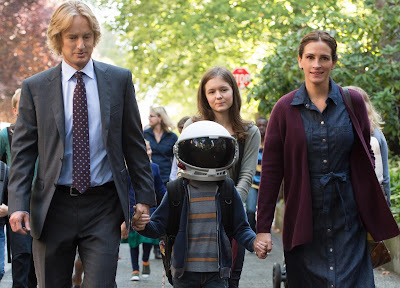 "Wonder" chronicles Auggie's first year in school as well as the lives and times of his devoted Father, Nate (Owen Wilson), his high school aged sister Via (an exquisite Izabela Vidovic), her boyfriend Justin (Nadji Jeter) and estranged best friend Miranda (Danielle Rose Russell) plus Auggie's first classmates Jack Will (Noah Jupe), Summer (Millie Davis), Charlotte (Elle McKinnon) and Julian (Bryce Gheisar) and instructors from Principal Mr. Tushman (Mandy Patinkin) and the young, precept delivering English teacher, Mr. Browne (Daveed Diggs). If you are completely unfamiliar with the story of Auggie Pullman, I am certain that the plot of the film might make you fear that what we have is an experience that will make you queasy from the overwrought sentimentality and forced manipulation of your emotions. I completely understand that perception as this film could have disastrously gone the route of the the most treacly Hallmark/Lifetime movie you have ever seen. Thankfully, Stephen Chbosky's "Wonder" is more than decidedly not that sort of film in any regard whatsoever as he has created a most wise and wistful film that smartly allows every piece of its drama to unfold as naturally as the way life is lived. Just as he accomplished so beautifully with "The Perks Of Being A Wallflower,"--and for that matter, a film very much in the same wheelhouse as Peter Bogdanovich's "Mask" (1985)--Chbosky never forces his hand, nor overplays even one moment, understanding and always ensuring that the drama inherent to a story such as this one is untainted by false sentiments. For this film to work at its very best, the honesty of the piece desperately needs to shine through and Stephen Chbosky, heroically aided by his terrific cast and grounded firmly by the source material, has made a gentle, deeply touching yet powerfully honest film during which we are all forced to ask of ourselves the very same hard questions this particular cast of characters are asking of themselves regarding issues of friendship, prejudice, bullying, jealousy, envy, romance, wealth, class, and of course, the choice we are all faced with when asked to just be kind. Just as with the novel, Chbosky allows the story to spiral from Auggie to a variety of the film's additional and supporting characters, giving us a larger sense of perspective, of taking some time to walk in another person's shoes. It is here where Chbosky's non-judgmental approach works so effectively as each new detail of one character informs the film as a whole, therefore delivering a tapestry of characters who are fleshed out and compelling enough to demand their own movies--much like what was so brilliantly accomplished in Michael Showalter's "The Big Sick" earlier this year. Even with the cruel actions of the character Julian, Stephen Chbosky never allows his empathy to waver, for in his storytelling eye, every character deserves attention and understanding as to why they are who they are, and just as with author Jay Asher's brutal, haunting young adult novel Thirteen Reasons Why (2007), "Wonder" showcases deftly the undeniable truth that everyone is shouldering some sort of baggage, housing some private pain, some personal cross to bear and if we all just took a moment to try and elicit some compassion, what a better world we would possibly have overall...or at least a world where we tried to understand each other. Certainly with Auggie, his personal cross is unavoidable as the world is able to see, and therefore react (or not), to what he looks like, making his astronaut helmet a source of protection, of course. Yet, and just as with Justin Tipping's outstanding "Kicks" (2016), the image of the astronaut carries a symbolism so ever shifting and lyrical that "Wonder" is often more poetic than it may appear to be. For as often Auggie's astronaut represents isolation and escape, it also represents deliverance and euphoria, and Stephen Chbosky executes every moment with a confident, sympathetic hand that never fails his characters and film by nosediving into the maudlin. Now, I have previously stated that "Wonder" earns every tear that will undoubtedly be shed while watching the film. I have to announce to you that I, your friendly neighborhood film enthusiast, cried often throughout the film and I have to say that the overall effect was not the feeling of being manipulated but the feeling of being cleansed. You see, as far as I am concerned, "Wonder" did not exist to get the audience to the one scene where one's personal floodgates could be opened. For me, I found myself tearing up solely through the multi-faceted compassion that Chbosky put into place from beginning to end, which meant that mere moments inspired the tearful response I had. In doing so, "Wonder" is one of the bravest films of the year as it is unafraid to not just wear its cinematic heart upon its sleeves, it is a film that flies in the face of the darkness that is enormously prevalent in the world, including the very films that house our cineplexes. Just think about the state of the movies in the 21st century, certainly reflective of our collective psychological and spiritual status but also, one could argue, a state of almost hipster fueled notions of what is considered to being seen as "artful" or "compelling" or "provocative." Just because a film is seen as being "dark," it does not make said film any more mature or even as adult as other films that are not as overtly grim. In some cases, those sorts of films are flat-out juvenile in their approach and even self-congratulatory arrogance. With "Wonder," Stephen Chbosky has helmed a most artful PG rated film. While essentially directed towards an audience on the cusp of adolescence, this film is designed for absolutely anyone, anywhere of any stage of life that possesses an open, beating heart and is more than deserving of a film that is not only empathetic, but one that inspires and is worthy of discussion and debate, that is intelligent, as well as conceptually and emotionally complex. There are no easy answers, so to speak, within "Wonder," for even the one answer that the story promotes is precisely the very answer that we all so often find incredibly difficult to enact in the real world. Easy to say, so hard to do but unquestionably the right thing. Stephen Chbosky's "Wonder" fully exceeded any expectations that I may have had for the film and it definitely extinguished any reservations I previously held. It is rare to find films these days that could meet any potential viewer at any conceivable state of mind, body and spirit and hold a clear-eyed conversation in an open, honest, even-handed and inoffensive yet highly provocative fashion. It is a film where its supreme warmth emanates from the screen and travels straight to your heart, hopefully inspiring all who see it to indeed "choose kind" in this precariously turbulent world. "Wonder" is one of my favorite films of 2017. THE LOBSTER'S NIGHTMARE: a review of "The Killing Of A Sacred Deer"
Last year, I announced to all of you that "The Lobster," Writer/Director Yorgos Lanthimos' debut English feature was my number one favorite film of the year. In fact, I even went much further in my extreme admiration for the bleakly grim, satirical story of a dystopian future society where single people were given a time limit of 30 days or else be transformed into the animal of their choice as I stated that it was undoubtedly one of the most audacious, creative, inventive, visionary and downright best films that I had seen over the last ten years. I stand firmly by those sentiments even now, while also understanding that essentially anything that Lanthimos devised for his follow up feature would have some big shoes to fill. And while his new film, "The Killing Of A Sacred Deer" doesn't quite pack the same cumulative punch as "The Lobster" achieved for me, I have to tell you that it does indeed come pretty damn close. As with "The Lobster," Yorgos Lanthimos has continued to immerse himself within a cinematic aesthetic that recalls the stylistic flourishes of Stanley Kubrick circa his work in both "A Clockwork Orange" (1971) and "The Shining" (1980), from shot compositions, disorienting and increasingly disturbing usages of classical music, as well as the cold, detached chilliness of the proceedings that ultimately belie the heated emotional turbulence of the story, characters and devastating consequences. But rest assured, Yorgos Lantimos is no Kubrick copycat, as the cinematic universe he has created, while reminiscent of some elements we could find in the works of Wes Anderson, Terry Gilliam as well as the aforementioned Stanley Kubrick, is as unique as one's specifically individualized bad dreams. 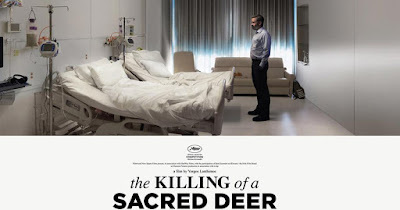 In those terms, "The Killing Of A Sacred Deer" is an especially bad dream indeed but one that makes for explicitly exciting and sometimes enthralling cinema. Yorgos Lanthimos' "The Killing Of A Sacred Deer" reunites him with his leading actor from "The Lobster," again a fully committed Colin Farrell who stars as Steven Murphy, a highly skilled and successful heart surgeon, living a more than comfortable existence in suburbia with his equally successful ophthalmologist wife Anna (Nicole Kidman) and their two children, teenaged Kim (Raffey Cassidy) and her younger brother Bob (Sunny Suljic). For a period of time Steven has been taking in the company of the teenaged Martin (Barry Keoghan), an awkward, somewhat fawning and Fatherless high school student, with whom the twosome share a connection. The boy soon ingratiates himself into Steven's family and slowly begins dating Kim. In a cinematic year where horror films have transcended its own genre to encompass larger subject matter and therefore, holding a mirror to reflect the horror that exists in the real world every day, from Andy Muschietti's "It," Sofia Coppola's "The Beguiled," Darren Aronofsky's "mother!," and most brilliantly, Jordan Peele's "Get Out," Yorgos Lanthimos's "The Killing Of A Sacred Deer" is especially uncompromising and terrifying. Lanthimos has devised a tale of such strenuous and tightly wound psychological horror that the experience holds you within its vice grip as its languid, insistent pacing gradually pulls you under like quicksand. While there are aspects of the film that are inexplicable, this tactic only serves to increase the terror and anguish of the characters as Steven is indeed faced with an impossible choice that Lanthimos has no intention of ever truly letting him off of the hook--try as Steven desperately attempts to no avail. Yes, the events are all present in the title. There is a killing but the "sacred deer" is for you to see for yourselves if you are indeed willing to undertake a film that, while never gratuitous, is just not interested in making the experience easy to undertake by any means as Lanthimos has created a film of karmic retribution at its most viscious, and I would not be surprised if some viewers feel is morally repugnant. In a way, "The Killing Of A Sacred Deer" reminded me a little bit of Richard Kelly's "The Box" (2009), the mesmerizing yet deeply flawed thriller of a young couple given the choice of pressing a button located on top of a box after which they would receive one million dollars, yet once the button is pushed, someone they do not know will die. Unlike that film, which was undone by its own meandering and downright messy qualities, Lanthimos is in complete control of his material, slowly twisting the knife at the right pace and at the right time until the precise point where the tension will be stretched to its breaking point. But to what end, you ask? I think that Lanthimos is utilizing the brutality of the story to frame another exploration into an existential crisis of self perception, especially as it relates to our own individualized relationships with personal morality and how one's personal value system can clash with another's. In "The Killing Of A Sacred Deer," the value systems of Steven and Martin and eventually Steven and his family and even then, the family members against each other clash violently and irrevocably. Yet, given the sinister nightmare logic of the film and its upending strangeness-- so crisply visualized by Cinematographer Thimios Bakatakis--we are not being presented with a "real" world, so to speak. "The Killing Of A Sacred Deer is actually the nightmare a character in The Lobster may have. You'd wake up relieved to be in the world of The Lobster if that was your dream." As bizarre as that statement may appear, it really feels to make perfect sense once having seen the film for myself. As with filmmakers like the aforementioned Wes Anderson, Terry Gilliam, Stanley Kubrick to even Quentin Tarantino, I am curious if Yorgos Lanthimos is devising a larger cinematic universe for his own horrifically idiosyncratic stories. Whether the imagined worlds of both "The Lobster" and "The Killing Of A Sacred Deer" are necessarily worse than the other would be up to each and every viewer (for my money, the world of "The Lobster" is more terrifying), it does indeed feel as if the character of Steven Murphy as played by Colin Farrell could have been a dream world projection of his character from "The Lobster," as he forces himself to confront his own perilous predicament in trying to avoid a seemingly inevitable fate of being transformed into a lobster and ultimately eaten by the very human beings he used to be himself by working through his quandary in a dream word where he is faced with another devastating and inevitable fate. Not every little element necessarily makes sense within "The Killing Of A Sacred Deer" and that is perfectly fine as the film is filtered through this apocalyptic creeping doom that is inescapable, like the feelings we experience during bad dreams. Colin Farrell's excellent performance, with his clipped, deadpan delivery, is virtually an echo of his exact performance from "The Lobster," making me feel as if he is indeed portraying a variation of the same man. Additionally, Lanthimos includes elements of damaged eyes into the mix plus having crucial decisions play out in diners and to that end, even the animal theme arises again but in ways that are more visually explicit than conceptual. Quite often, it felt to me as if the world of "The Lobster" had been toyed with and therefore, re-contextualized into this new environment of "The Killing Of A Sacred Deer." Yet, what if this world is not a dream, so to speak, but more of an extension of the world of "The Lobster"? Frightening, indeed. But, it unquestionably showcases the superb artistic skill of Yorgos Lanthimos, ensuring that he is a filmmaker to really keep your eyes upon. Yorgos Lanthimos' "The Killing Of A Sacred Deer" is difficult, demanding, and undeniably strange but it is also yet another example of why we need to have filmmakers like Lanthimos in the word devising stories designed to rattle our cages and shake us out of any sense of cinematic complacency. No, it is not for everyone and nor should it be. But it is a film that refuses to be ignored as it forces us to have a connection and response to it. Yes, it will disturb you. Perhaps to the point of wondering just what is the purpose of everything presented, especially when it is a vision so unrepentant, so seemingly nihilistic. To that, I simply state to you that "The Killing Of A Sacred Deer" is not explicitly real. It is an especially brutal parable. A punishing morality play. It is Greek tragedy. PSYCHEDELIC THUNDER AND COMIC LIGHTNING: a review of "Thor: Ragnarok"
To the God Of Thunder, the lighter touch suits you very, very well! We should really admit what a difficult character and landscape the character and world of Thor actually is to visualize. Of course, with costumes and special effects, we can envision essentially anything at all these days but in regards to the tone...that is dicey indeed as we have this figure who represents the grand epic reach of Norse mythology and the earthly eye candy of comic book derring do. Should he be presented with a certain reverence or as full on camp because in essence, Thor is a bit of a silly character who is shouldered with heavenly realms, rainbow bridges, faux Shakesperian heft and of course, that mighty hammer. 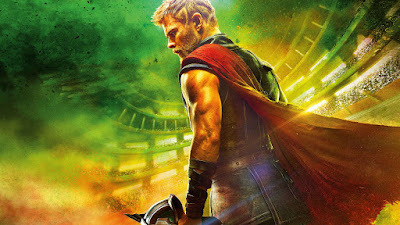 Thankfully, with his cinematic entries and inclusion within the ever expanding Marvel Comics Cinematic Universe, the filmmakers have provided Thor with a bit of a conceptual hybrid firmly anchored by the genius casting of Chris Hemsworth in the titular role, an actor who has rolled so confidently with everything a variety of filmmakers have tossed his way over the course of the four previously released films. Kenneth Branagh's "Thor" (2011), our hero's debut feature, was a real kick to me, as it was a blast of fun that struck the right balance between the bombast and the ridiculous, giving Thor a strong solo introduction. Joss Whedon served the character exceedingly well in "The Avengers" (2012) and "Avengers: Age Of Ultron" (2015) by merging his otherwordliness seamlessly with his earthy superhero companions. Only Alan Taylor's "Thor: The Dark World" (2013), failed the character (and as far as I am concerned, the Marvel films as a whole) as it was ponderous, bloated, and just plain dull. So, now that we know Thor very well, there remains the problem of how to proceed because in essence, he is not terribly interesting conceptually and the primary conflict of his character regarding his sense of heroism and a growing humility and empathy for his fellow inhabitants of the universes of Asgard and Earth has been more than completed. After all of this time, what could possibly make him more compelling? Who would've thought that what Thor truly needed was a healthy dose of humor. Not the dabbles we have received in the previous films but a truly hefty supply, so much so that it nearly re-invents the character, fully revitalizes Thor's solo film adventures and further injects the Marvel films with higher creative risks without dismantling all that has arrived before. Taika Waititi's "Thor: Ragnarok," our hero's third solo entry, is precisely what the God Of Thunder needed as Thor is catapulted into what has got to be his wildest ride to date, augmented with a dazzling array of sights, sounds and most surprisingly, a level of pure comedy that only elevates the action, the characters, the drama, and the odyssey. Finally, Thor has been given a film completely worthy of a Norse God while also illustrating that the superhero film genre, one that I have grown increasingly weary, indeed possesses quite a bit of remaining vibrant life. As "Thor: Ragnarok" opens, we find or hero in a bit of a mess. Now two years after the events of "Avengers: Age Of Ultron," Thor has traveled the universe in an unsuccessful bid to locate the Infinity stones and in the process, has found himself caught within the clutches of the demon Surtur, who reveals to Thor that his Father Odin (Anthony Hopkins) is no longer living in their kingdom of Asgard and that once he joins his crown with the Eternal Flame that burns beneath Asgard, the prophecy of Ragnarok (i.e. the apocalypse) will come to pass. It is not a spoiler to tell any of you that Thor does indeed defeat Surtur, robbing his crown in the process. But the prophecy of Ragnarok, however, has not been fully extinguished as Thor is confronted with the unprecedented fury of Hela, Goddess Of Death (a scorching Cate Blanchett), who is also Odin's firstborn daughter, of course making her sister of Thor and the duplicitous Loki (Tom Hiddleston)! Hela's unrepentant rage and desire to destroy Asgard, once unleashed, propels Thor into uncharted territory externally as well as internally, as he finds himself in the far reaches of the universe and trapped upon the wormhole ridden garbage planet of Sakaar, overseen by The Grandmaster (a delightfully unctuous Jeff Goldblum), and completely without his trusty hammer, which Hela disintegrated. Forced to serve as The Grandmaster's gladiator in battles reminiscent of sights seen in George Miller's "Mad Max Beyond Thunderdome" (1985), Thor is fully reunited with The Hulk (Mark Ruffalo), also missing in action since "Avengers: Age Of Ultron." Yet, in order to survive and hopefully save Asgard, Thor eventually joins forces with not only Loki but the hard drinking bounty hunter, former winged horse warrior Valkyrie (a wonderful Tessa Thompson). Taika Waititi's "Thor: Ragnarok" is easily the very best of Thor's solo features and alongside Joss Whedon's "The Avengers" plus Peyton Reed's "Ant-Man" (2015) and Jon Watts' "Spider-Man: Homecoming" from this summer, Waititi fulfills and often exceeds the cinematic promises made with the inaugural Marvel feature Jon Favreau's "Iron Man" (2008) as he has delivered a film that is irreverent as it is epic, all the while suggesting where this film universe could possibly extend itself if they are willing to follow Waititi's lead and jump into the deep end of creative risks. Just with the character of Thor himself, Waititi almost immediately takes everything we know about this figure and either playfully alters what we know or discards it altogether, especially through the shearing of his long blonde locks, and the destruction of his hammer, which he does indeed go without for nearly the entirety of the film. But the most notable change to the once stoic figure is his newfound sense of humor, which runs in quick witted fashion from the sardonic to the satiric to the downright silly while not sacrificing all of his other heroic qualities. He hasn't become glib, so to speak. He is just looser, doesn't take himself quite so seriously as he used to, fully suggesting that his time spent with the likes of Tony Stark has been positive, to say the least. That frisky spirit is indeed the tone of "Thor: Ragnarok" and it is as welcome as it is daring and even dangerous as the silliness and self-acknowledgement of its own silliness often threatens to runs the film clear off of the rails and miraculously, Waititi keeps himself and his film on that knife's edge balance where one really false move would cause the film to unravel altogether and somehow, someway, it just never happens. Waititi is a smart enough filmmaker to realize that he still needs to tell a story and thankfully, he isn't quite willing to make the entire proceedings a flat out joke (something I was indeed a tad worried about before I saw the film). Waititi is affectionate towards the character and world of Thor, even while being all too knowing of how preposterous it all actually is. But, instead of being self-congratulatory with the film's comedy--a failing of both of James Gunn's dishearteningly smug "Guardians Of The Galaxy" entries (2014/2017) and especially, the self-congratulatory arrogance of Tim Miller's "Deadpool" (2016)--"Thor: Ragnarok" flies by the seat of its "kid-in-a-candy-store" aesthetic and we are all whisked away in tow. Chris Hemsworth truly appears to be enjoying himself is grandly new levels in the titular role as his riffs with Loki, Hulk and this odd rock like creature performed by Waititi himself showcase the light footed swiftness of his comedy ad the film is all the better for it. And just as with the film's director, Hemsworth has also not lost sight of who Thor is and whatever dilemmas he may find himself confronted with and in "Thor: Ragnarok," he does indeed find himself faced with life altering choices, conflicts and consequences which will reverberate throughout subsequent Marvel films unquestionably. Cate Blanchett is indeed one of the actresses I felt would be least likely to appear in a superhero film and believe me, with "Thor: Ragnarok," she has proven herself to being one of the finest (in more ways than one--I can't help it, her new look is hotter than molten lava). As Hela, Blanchett evokes such palpable fury, rage, and destruction that you can firmly believe her but as with the surrounding film, Blanchett performs it all with a slight "isn't this hysterical?" wink that only further draws you in closer and you hang onto her every outrageous, venomous threat and command. Even as terrific as Hemsworth, Blanchett and the bulk of the cast happens to be, the arrival of Tessa Thompson is undoubtedly one of the Marvel film's greatest catches. As Valkyrie, Thompson is gloriously perfect in the role, supremely convincing from her first appearance and captivating from one end of the film to the other, so much so that I strongly feel that she demands to have her own movie. After her striking turns in Justin Simien's incendiary "Dear White People" (2014) and Ryan Coogler's stirring "Creed" (2015), Tessa Thompson has grabbed this opportunity to be seen by a larger, wider audience so powerfully with both hands and the pure unadulterated energy of "Thor: Ragnarok" is elevated every time she appears on screen. And what a sight every single frame of "Thor: Ragnarok" happens to be!!! Again, Taika Waititi's approach to the film is unrestrained gleefulness, as if he was a child who was able to grab every crayon and marker in their respective boxes and was allowed to use them all in any way he wished. The visual display of the film is stunning with its resplendent rainbow psychedelic glory, a crucial element that adds to the overall playful, and most importantly...comic book tonality of the film. Even with all of the fun, Waititi has crafted a host of images and sequences (the Thor VS. Hulk battle is one of many showstoppers) that would make Zack Snyder fall to his knees in amazement. Unlike Snyder, Waititi understands to make his film downright fun to behold and not some torturous, bludgeoning slog, the comedy does indeed accentuate the drama and vice versa. As frivolous as "Thor: Ragnarok" often is, I greatly appreciated how Waititi ensured that we do indeed care about Thor's latest adventure, we are excited when we need to be, thrilled when necessary and struck with a certain shock and awe at the precise points when they need to arrive. In many ways, if there is a film that I could sort of compare "Thor: Ragnarok" with it would be none other than the cult classic, Mike Hodges' "Flash Gordon" (1980) starring a voice dubbed Sam J Jones in the title role and the brilliant Max Von Sydow as the arch nemesis Ming The Merciless--a film I loved and saw countless times growing up. It was an absolutely ridiculous film that lovingly honored its 1930's-1940's comic book and film serial roots and was filled wall to wall with purposefully cheesy visual effects and day-glo colors which adorned a downright crazy plot that included boisterous flying Hawkmen, alien guards pummeled by footballs, mad scientists, an enormous and hungry swamp spider, a tilting platform filled with dangerous spikes, lusty alien women, an interstellar wedding, and all manner of space battles decorating a story of Flash attempting to save Earth from destruction...and set to a theater shaking film score composed and performed by none other than QUEEN! As I think about "Thor: Ragnarok," I cannot hep but to wonder if "Flash Gordon" was anywhere in Taika Waititi's mind when conceiving of this new installment--especially as Led Zeppelin's classic "The Immigrant Song" is perfectly used as Thor's battle cry. 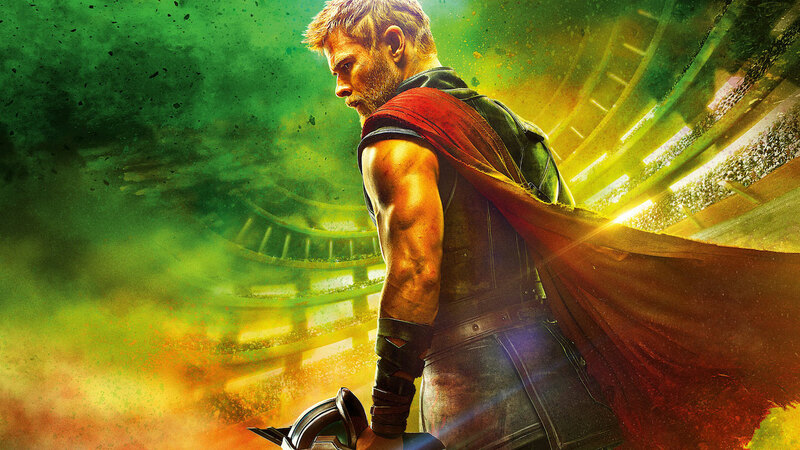 You know, even further than "Flash Gordon," I really think that "Thor: Ragnarok" is Taika Waititi's cinematic version of Queen's mammoth "Bohemian Rhapsody," a song that is by turns majestic, hilarious, inscrutable, preposterous, stunning, glorious, beautiful and filled with an ocean of sounds that feel like the colors of the largest paintbox come to life and dancing through our speakers. That's what "Thor: Ragnarok" is like--a paintbox come to life with rock and roll energy combined with a terrific stand-up comedian's expert sense of comic timing. This is exactly what a character like Thor deserves and so thankfully, this is heroically what we have all received. 1. "THOR: RAGNAROK," the latest entry in the Marvel Cinematic Universe and the third film starring the Norse God Of Thunder himself will be released this coming weekend and even with the already rapturous reviews, I do remain cautiously optimistic. 2. "WONDER," the second film from Author/Writer/Director Stephen Chbosky, who previously helmed the beautifully bittersweet "The Perks Of Being A Wallflower" (2012), is itself another adaptation of a powerfully celebrated young adult novel but this time the source material did not arrive from Chbosky's own pen but from Author R.J. Palacio, whose original novel is indeed one of the very best I have ever read. I sincerely hope that Chbosky honors this source material in all of the right ways. 3. "THE KILLING OF A SACRED DEER," from Writer/Director Yorgos Lanthimos is his follow-up to my personal #1 favorite film of 2016, the crystalline nightmare satire "The Lobster." With that one film, Lanthimos has me in the palm of his cinematic hand and so...I am there! 4. "LAST FLAG FLYING"Two words: RICHARD. LINKLATER. 'Nuff said! Certainly, this wish list of mine completely depends upon time, responsibilities, energy and of course, if these films arrive in my city. But, this is my plan and I hope to make it come to vibrant life for myself as well as for you. So, as always, I ask of you to wish me the best of luck and I will indeed see you again when the house lights go down!!!!! !